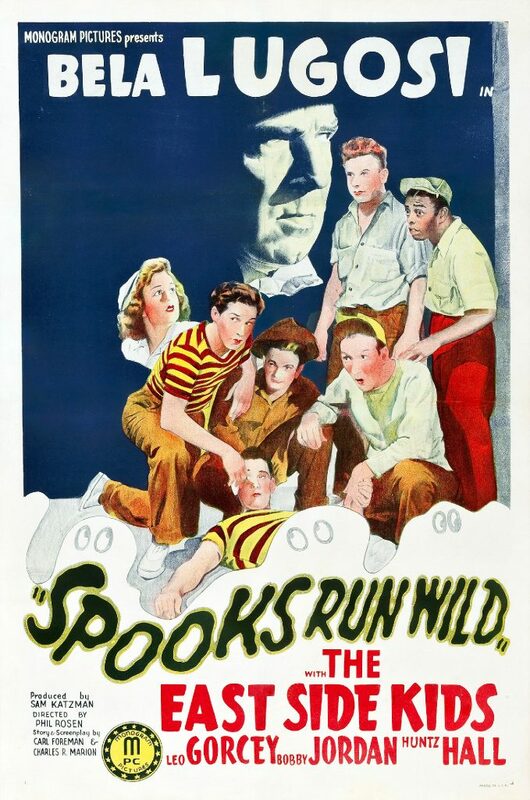 Spooks Run Wild is an American horror comedy film and the seventh film in the East Side Kids series, starring Bela Lugosi, Leo Gorcey, Huntz Hall, and Bobby Jordan. Released in 1941, it was directed by Phil Rosen, in his first and only outing in the series, and produced by Sam Katzman (under the company name Banner Pictures). It is based on an original script by Carl Foreman and Charles R. Marion. Members of the New York City East Side boys club—leader Muggs (Leo Gorcey), Danny (Bobby Jordan), Glimpy (Huntz Hall), Scruno (Sunshine Sammy Morrison), Skinny (Donald Haines), and Peewee (David Gorcey)—reluctantly board a bus bound for summer camp. The bus stops in the town of Hillside, where Muggs and his pals flirt with Margie, a soda fountain waitress (Rosemary Portia). While they are there, a radio broadcast announces that a maniacal “monster killer” is in the area. When they arrive at the camp, the counselor, Jeff Dixon (Dave O’Brien), complains to his girlfriend, camp nurse Linda Mason (Dorothy Short), that he will get no work done on his thesis because of the rowdy juvenile delinquents. One night, Nardo (Bela Lugosi), a mysterious caped figure, and his dwarf assistant, Luigi (Angelo Rossitto), ask a local gas station attendant for directions to the hilltop Billings house, which has been deserted for years since its owner was murdered. After he leaves, another car arrives and the attendant recognizes the driver from his mystery magazines as Dr. Von Grosch (Dennis Moore). The attendant believes that Nardo is the killer and Von Grosch is hunting him, and he alerts the local constable that Nardo is a suspect. One night, Nardo and Luigi sneak into the local graveyard and are shot at by a grave digger. That same night, Muggs slips out of camp hoping to rendezvous with the soda fountain girl, and is followed by all his pals. The East Side Kids get lost in the woods, and when they wander into the graveyard, Peewee is also shot by the digger. The boys take Peewee to the nearby Billings house, where Nardo tends to his minor injury and gives him a sedative. Nardo lets the boys spend the night, but Peewee disappears while sleepwalking. The rest of the boys are unable to sleep because of Nardo’s strangeness and Peewee’s disappearance. Linda, meanwhile, also disappears while out searching for the boys, and Jeff goes to the police for help. When the boys confront Nardo, he claims not to know where Peewee is, but insists that the boys remain in the house. Muggs distrusts Nardo and on his command, the boys attack him and roll him into a carpet. Skinny and Glimpy disappear through a secret passage, and Scruno is spooked when Nardo reappears. At constable Jim’s office, the grave digger recalls seeing the boys, and Jim believes they may have fallen into the killer’s hands at the Billings estate. The boys, meanwhile, search for Peewee, but are continually being surprised by the appearance of coffins and objects that move themselves, and by the disappearance of their pals through walls and closets. Linda, meanwhile, accepts a ride from Von Grosch, who takes her to the Billings house, ostensibly to help the boys. Muggs and the boys succeed in terrifying Nardo by pretending to be a ghost, and they finally find Peewee back in bed. Just after Linda and Von Grosch arrive at the house, Von Grosch attacks Linda. The police burst in and accuse Nardo of being a killer, but Muggs has already learned that Nardo is merely a magician. When they all hear Linda screaming inside a locked room, Muggs climbs onto the roof and enters the room through a window. While he struggles with Von Grosch, who is the real “monster killer,” Linda opens the door, and the police arrest Von Grosch. Later, Nardo performs magic tricks for Jeff, Linda and the boys, and when Muggs goes into a cabinet after a disappearing girl, he emerges with Scruno in his arms.